With around eight million visitors every year, the Niagara Falls is one of the most visited tourist spots in the world. 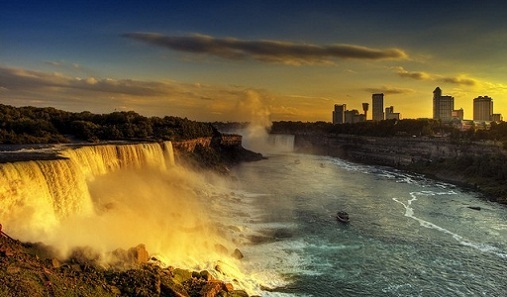 The Diversity of the wonder of the picaresque Niagara Falls attracts thousands of travelers from around the world, especially people looking for couples getaways and family summer vacations during the summer break. Summer is prime time to visit Niagara Falls, where the weather is being warm during the day and comfortable at night. The longer daylight hours, summer specials, attraction packages and events, which are altogether make Niagara Falls one of the perfect summer destinations in the world. Niagara Falls is located between the United States and Canada, with the cities of Niagara Falls located on each side of the border. Both sides of Niagara Falls have a variety of accommodations, from elegant hotels to small motels, located just outside of the city, which all of them provide attractive Niagara Falls Summer Packages. Best Western Fallsview Packages are specially made summer attraction packages apt for kids, couples and family. Visitors who enjoy an active nightlife may want to consider staying on the Canadian side of Niagara Falls. There are several hotels and motels located near the popular Clifton Hill area, where visitors enjoy walking, shopping, dining, and visiting many of the local attractions during the day and at night. The American side of Niagara Falls too offers excellent choices in hotel accommodations and summer getaways, but considering the evening summer activities they are limited compared to other side of Niagara Falls. Niagara Falls Boulevard, otherwise known known as Route 62, extends from the downtown area in Niagara Falls (U.S.) and leads to their tail district-a paradise for shoppers. Both sides of the Niagara provide 5-star hotels , family style motels, bed and breakfasts, fully equipped campsites and vacation rentals according to the taste of diverse visitors. Be sure to check for the Niagara summer specials and getaway packages as all accommodations offer a whole range of packages for Niagara summer vacation. Niagara Falls is a natural wonder, with many outdoor activities and attractions that keep visitors busy. On Friday and Sunday nights during the Niagara Falls Summer, fireworks are scheduled over the Falls. The Clifton Hill area is located at the entrance to Canada, near the border, and it hosts wax museums, restaurants, stores, and other attractions that truly make Niagara Falls an unforgettable summer vacation spot for people of any age group. The main advantage is that it is easy to walk around the area and shop at Clifton Hill, without requiring a car. Before planning a trip to Niagara Falls, make a list of attractions and events that are available during summer vacation. Take a look at Niagara Falls summer getaways, attractions, tourist activities and summer vacation Packages offered by Best Western Cairn Croft Hotel. The summer season is the busiest season in Niagara Falls, and that has many benefits for visitors looking for attractive Niagara Falls Summer Vacation Packages. Come, relish Niagara Falls in summer. Don't forget to go through our site your whole vacation in Niagara Falls can be booked through Info Niagara. Let this summer, be your Niagara Falls Summer!